Free airport transfer (one way) when you book 5 days or more for 4 person. Free WiFi and local prepaid cell/mobile phone for your convenience. 2 full bathrooms, 2 bedrooms. A superb 105 m2 (1130 sq ft) three room apartment at excellent location. 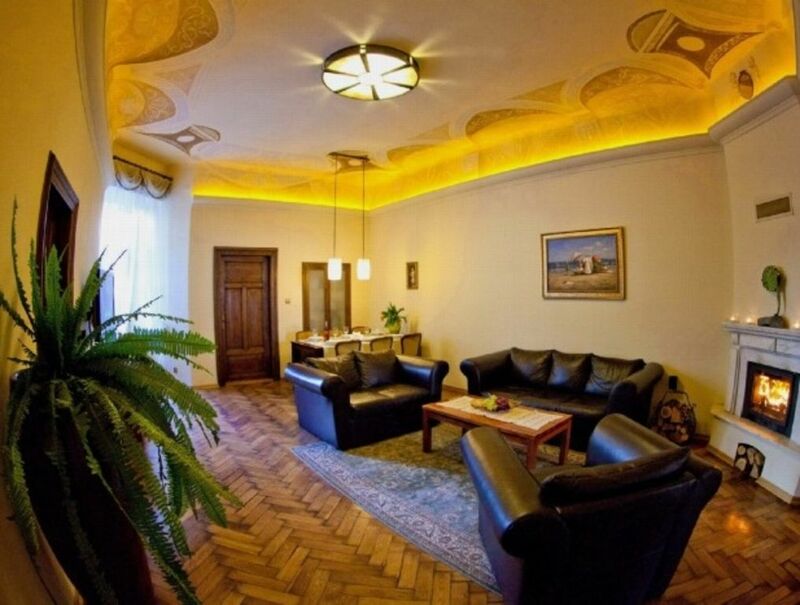 Thanks to its location, in the centre of Krakow's tourist attractions - at equal distance from the Main Square, the Wawel Castle and Kazimierz Quarter - only 5 minutes walking distance, our apartment may be an excellent starting point for excursions. It is an ideal place for families or groups of friends. We are absolutely positive that you will be surprised with its spaciousness, equipment, unique interior decorations and quality that cannot be found in most of the local hotels. To give you the feeling of the old bourgeois residence with the lot of care we have reconstructed the murals that nowadays can be admired only in few apartment houses in Krakow. Fully equipped kitchen, two bathrooms, fire place in the living room, digital TV, free access to Internet and a guarded parking place at the distance of only 300 meters make it a very attractive alternative of a hotel. A lovely apartment stayed here for four nights everything you need to make a great stay,central to all the sights with an easy walk to the square,Jewish quarter and the royal castle. Witek met us at the apartment with lots of useful information. I would not hesitate in recommending this apartment, we will be returning in December. Our family of 6 (mom & dad with 4 teenage kids) enjoyed our stay in this apartment! It was roomy, had everything we needed, felt very safe, and was walking distance to everywhere we wanted to visit in Krakow. Grazyna was a terrific host! We highly recommend her apartment! Very warm welcome! Apartment was very clean and well equipped. Little touches like toiletries and basic cupboard essentials were very much appreciated. We loved Krakow and will most definitely return. We are glad you liked your stay. We uploaded picture of a new front door to the building. We think one week with temporary door was worth the final resault. What to the beds, nobody has complained about it so far, we have placed a photo of the last entry in our guestbook who appreciate their softness. We hope to see you again. This is the second time we have stayed in this apartment and we enjoyed it every bit as much as the first time. It is ideally situated between the main square and the Jewish quarter and only a short walk to the river. Huge apartment with great bathrooms! Great location, easy walking distance to grocery store and town square. Grazyna was very nice and accommodating! She helped us with taxi rides to and from the airport. Highly recommend this rental. Apartment Sara is located in the center of Krakow's Old Town at 20 Sarego Street on the first floor of a renovated historical apartment house. The Sarego Street is a blind alley that makes it an oasis of peace and tranquillity in the heart of the city. Its additional advantage is that it is located at equal, close 5 min walking distance from the Main Square, Wawel Castle and ancient Jewish Quarter called Kazimierz that are the three greatest attractions of Krakow.